Sometimes we need the roar of the crowd or the hustle of a city; the lure of excitement just pulls us there. I love going to museums, shows and events, but like the Griswold's vacation, without a lot of time or the fortunate circumstance of living in close proximity we tend to warp speed through these fantastic outings. Let's face it, time is precious these days so we try to cram it all in and we often return from these packed adventures completely drained. What we all need more of is a little southern hospitality. Not far from exhaustion myself these days, I decided to celebrate my birthday relaxing with good friends. Our plans, my good friend Lindy and I, were to celebrate our birthdays with a big outdoor cookout party with a band. Well, we went from big plan to low key. The music wasn't eliminated it just went from rock band to fingerstyle guitarist (x2), which I honestly prefer, and the food was simpler but superb. In lieu of a band occupying the porch we moved the dining room table outdoors. The menu was fresh swordfish steaks wrapped in banana leaves with a pineapple curry chutney (Martha Stewarts got nothing on Lindy), shrimp and pineapple kabobs, vegetable pad thai and corn on the cob. YUM! Oh, let's not forget the cheesecake and homemade brownies for dessert and, as usual, the wine flowed. I'm thinkin' Bob and Lindy should convert pastures into vineyards, but then they probably already see enough of me. The whole weekend was grand, but besides the great company and the great food there was also the wonderful southern hospitality style accommodations. Not too far from "civilization" but far enough to provide tranquility and seclusion is The Herlong Mansion Historic Inn and Gardens. 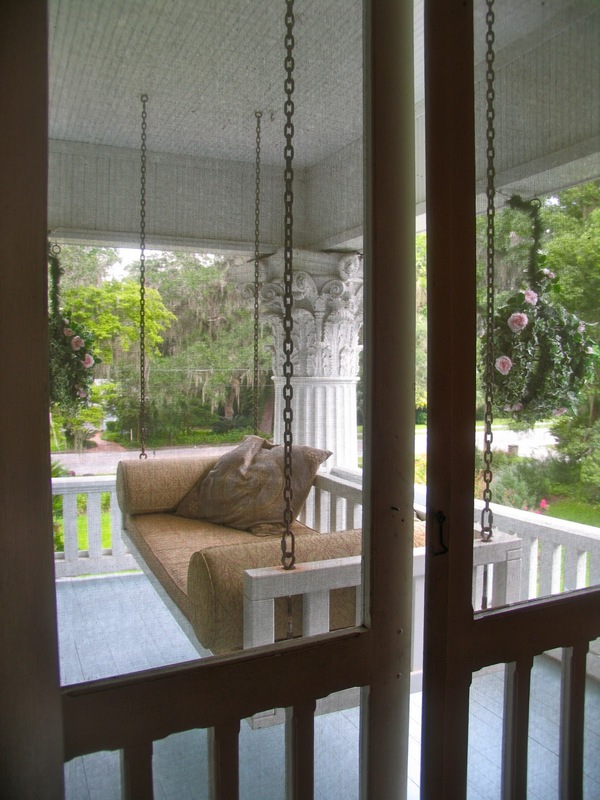 The Herlong Mansion dates back to the 1800's and was built by the Simonton family who were among the original settlers of Micanopy. It was a simple farm house back then and remained so until 1910 when a Simonton married a Herlong and his prosperity afforded them the wealth necessary to transform the simple home into the Southern style colonial mansion it is today. With its ornately carved columns and beautiful grounds passers-by find it impossible to resist a stroll up the front walkway. The interior with its very Arts and Crafts style leaded glass windows, fine wood paneling and wood floors is elegantly decorated with antiques but is not at all stuffy. 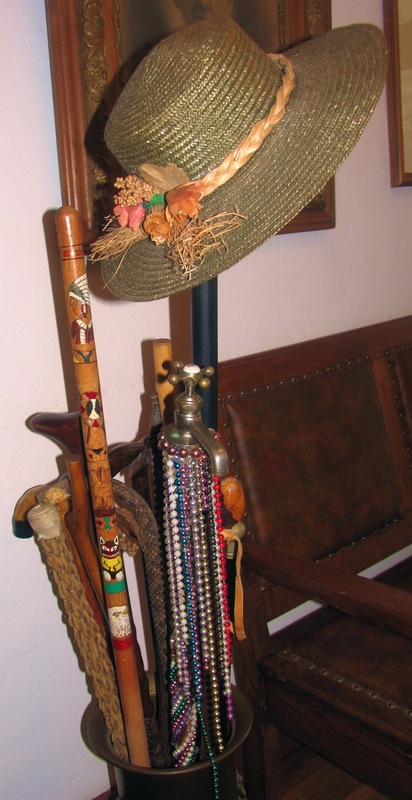 I think it has something to do with the touches of whimsy throughout, such as their collection of walking sticks and canes in vessels around the house. The smell of fresh baked cookies will lure you downstairs in the late afternoon where you'll find them set out for guests near the caraf of wine. In the evening port and brandy are available in the parlor. 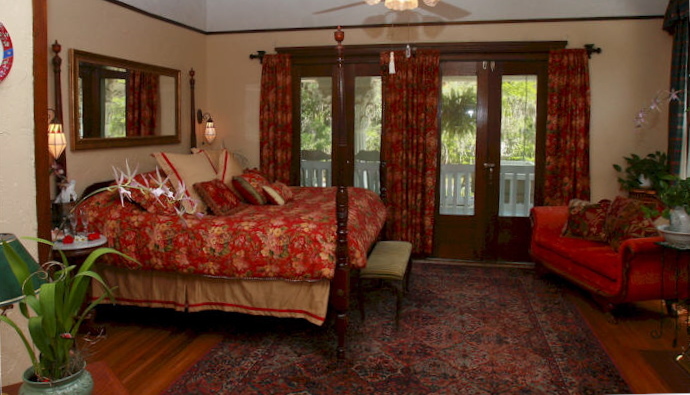 Warm touches are the signature of a well done Inn or B and B and this one exudes southern hospitality and charm! We stayed in the Herlong Suite a very spacious and beautiful room. All the rooms throughout the mansion are sumptuously decorated to the point of alluring, but my favorite part of the house has to be the hypnotic upstairs porch. Our room connected to the porch and we spent our mornings on it sipping coffee and evenings sipping wine. Nothin' could've been finer except perhaps to have had the sounds of Bob Brounley's extraordinary fingerstyle guitar music floating on the breeze from downtown to this porch*. This town, this place give you such a sense of belonging even in the briefest of stays. It beckoned to us in barely audible whispers, "come, relax, take a nap, read" and for a few days all the stress of life vanished with a whisper. *Bob's music-have a listen to this tunepak. I too have enjoyed the Herlong Mansion's quite comfort and southern hosptality. It was nice to read about your experience, it reminds me that I need to go back! I haven't been to this area in ages. Sounds like a wonderful place for rejuvenating.